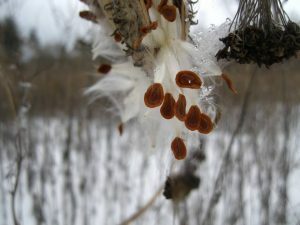 The La Crosse Community Foundation Annual Report has a packet of milkweed seeds on the front cover. These seeds may be planted so you can help the monarch butterfly. Monarch butterflies are beautiful and widely recognized butterflies. The life cycle of a monarch consists of four stages: egg, larva, pupa, and adult. Four generations of butterflies live each year. In February and March, the monarchs emerge from hibernation and find a mate. They migrate north and east from Mexico and find milkweed to lay their eggs in March and April. After 4 days, the eggs hatch into the larvae (or baby caterpillars). These caterpillars start eating the milkweed that they are born on. They shed their skin (instar) 5 times and after 2 weeks, they start the metamorphosis and create a chrysalis (pupa stage). This chrysalis lasts for 10 days and the butterfly emerges. The butterflies then continue their migration north and east and the cycle begins again for the second generation to be born in May and June. The process repeats and the 3rd generation in born in July and August. A monarch’s life last from two to six weeks. The fourth generation of monarch is born in September and October, and instead of starting the life cycle again, these butterflies migrate to Mexico and California to hibernate. Monarchs travel between 12 and 25 miles per hour and use the warm air currents to help them on their 2,500 mile journey. Aftern hibernation, they start the migration north and the first generation of the next year begins. Fourth generation monarchs live six to eight months. 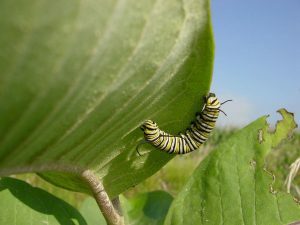 The only food that monarch caterpillars eat is the milkweed plant. A newly hatched larva, or caterpillar and does not eat much, but as it grows and molts (5 different times), more and more milkweed is consumed. In fact, one caterpillar could eat all of the leaves on one milkweed plant! There has been a significant decline in the monarch population in the last 25 years. One of the largest factors, according to biologists, is the expansion of wide scale planting of crops. For high yields of grain, corn, soybeans, etc., many seeds have been genetically manipulated to be resistant to powerful herbicides. The then grows and flourishes, but the grassland ecosystem that the fields used to be are drastically changed as no emergent seedlings or perennials survive the herbicide used. 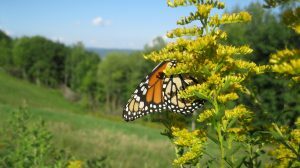 Not only do the herbicides kill the milkweed that the caterpillars need, they kill sources of nectar – flowers that the butterflies, and also honeybees need. Planting milkweed will immediately help the monarch. Planting other pollinating flowers will help a diverse group of pollinators, like butterflies and honeybees. Purchase any plants or seeds at nurseries that do not use pesticides or herbicides, especially neonicotinoids. Plants and seeds treated with these pesticides kill the butterflies and bees that they were meant to help! If the garden center or nursery does not know what pesticides are used, or if they are, inquire with the wholesale supplier. In the La Crosse area, Common Milkweed (Asclepias syriaca) and Rose Milkweed (Asclepias incarnata) are native perennials. They promote the survival of the monarch and have beautiful white (common) or rose blooms in the summer. Milkweed tends to spread through rhizomes (roots underground) and the seeds need a cool germination period of 30 days before they take root.